Tsukudani is a taste of common people. Eat it with steamed rice is very good. 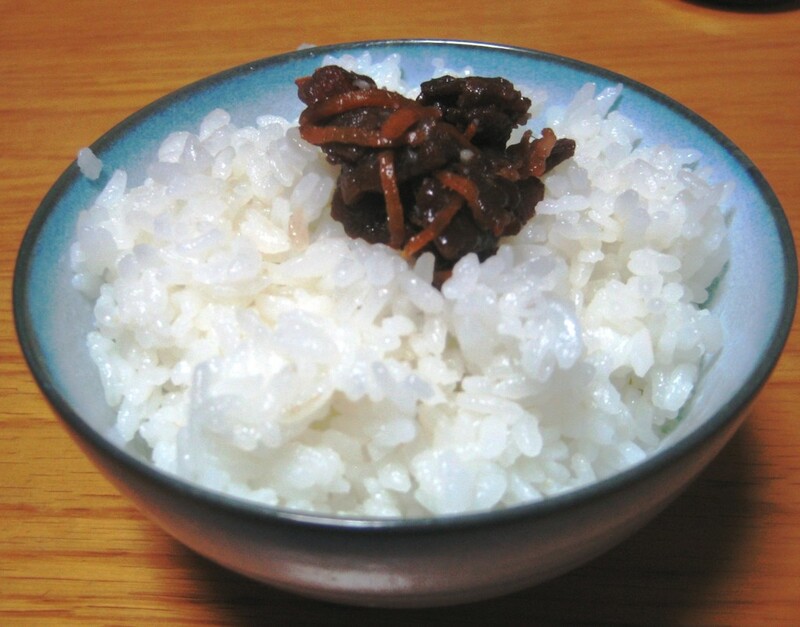 It is a kind of preserved food and typical one is simmered small fishes or shell fishes with soy sauce and sugar. It seems to be since mid 19th century. 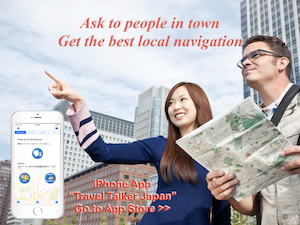 The name is named after place called Tsukudajima in Tokyo. Many good fishermen lived in Tsukuda village in Osaka had moved there. They cooked this food and it is called as Tsukudani. 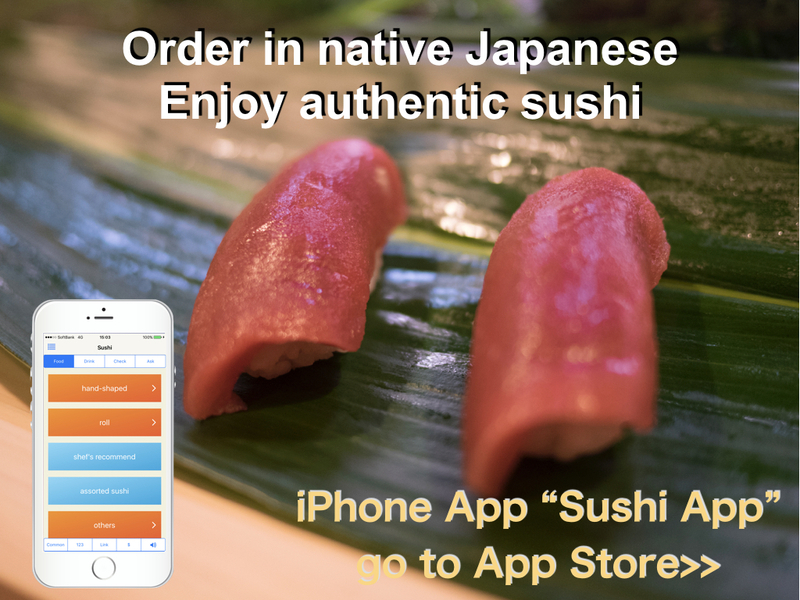 “Ni” means boiled or simmered. As the time Japanese people start to eat beef was about the end of 19th century, this food was developed after that. 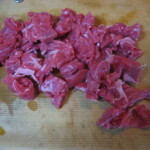 1) Cut beef and ginger into small pieces. 2) Combine all ingredients for sauce in a pan, then heat. 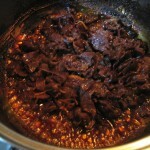 3) Once it boiled, put beef and ginger in the pan and heat it on a low heat until no sauce. 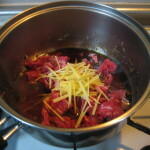 I cooked it with using beef which I had cooked sukiyaki before. 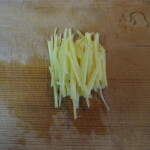 It can be stored long time in refrigerator and is very good side dish. However I used sliced beef at this time, it is not necessary. If you have beef for stake, please cut it as less as small. It is said less fat beef is better for this cooking. This cooking method is developed for preserve purpose because of too much the food. 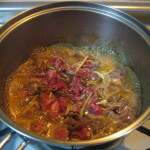 I am interested in preserved foods because I think it is a wisdom of people in old time when there is no refrigerator. And those methods are still useful. If anyone develop a new tsukudani which is using foods we have not used, it is fantastic.